Although they're becoming harder to find, beautiful porcelain dolls of the Victorian era still thrill collectors. Makers often marked these creations on the back of the neck, like those produced by Gebruder Heubach for instance, providing current owners a good place to start their research. Although the letters and symbols used on these beauties may seem cryptic at first, a little research using a good doll book will go a long way. Learning not only who made the doll, but where and when, makes the effort expended worthwhile. Keep in mind that doll makers are still copying antique styles with great success, and many of the porcelain heads look quite authentic. It’s wise to look at the body of a doll for clues about age. An older body will exhibit signs of wear that can’t easily be duplicated on a new doll. Composition dolls, along with more modern versions, often have the manufacturer's name on their bodies. Some dolls, like the Betsy McCall series made during the '50s, will be marked with the name of the doll and date as well. These clues help owners research the value of their collections. Even unmarked dolls can be identified once a collector gets a feel for unique characteristics associated with certain makers. Learning to recognize intricacies can be very rewarding and usually happens gradually as collectors learn and grow within their chosen doll collecting niche. When adding to any type of doll collection, considering quality and condition will always come into play. With porcelain dolls, look for smooth "skin" with lifelike coloring. Glass eyes should be firmly in the sockets and teeth should be in place with open-mouthed dolls. If the teeth are missing, a gentle shake may reveal they have dropped back into the neck and can very likely be restored by a reputable doll hospital. 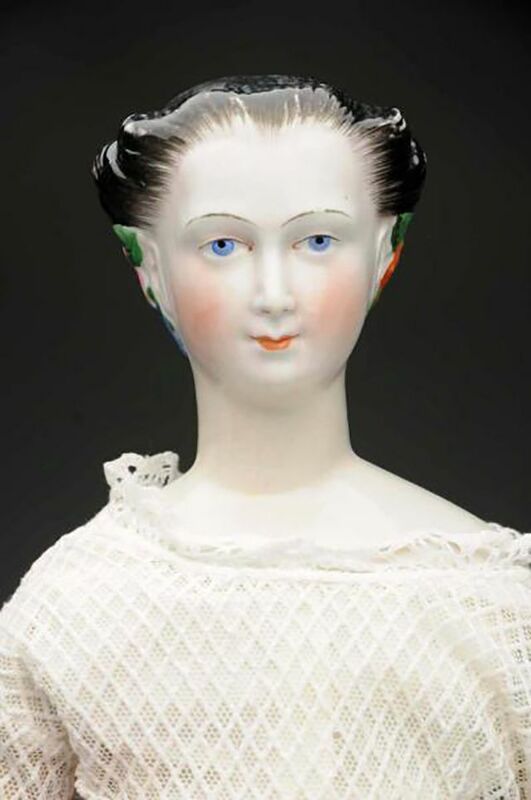 Various porcelain dolls with the same head mold can vary in price depending on how the face is decorated. And "closed-mouth bisque-head dolls can be twice as valuable as comparable open-mouth dolls," according to the Antiques Roadshow Primer by Carol Prisant. Original clothing and wigs are preferable on porcelain dolls of any age, but replacements are acceptable when styled appropriately for the period when the doll was produced. Crazing can be expected on many older composition dolls, but it will lower the value unless the doll is extremely rare. When vinyl dolls are found with darkened or brittle heads and limbs, it's likely due to being stored in an attic or garage where they've been exposed to extreme heat rendering them virtually worthless. Other types of dolls should be well made and clean or values should be adjusted downward. The Antiques Roadshow Primer also notes that Magic Skin baby dolls, dirty Barbies and American composition dolls show up for evaluation frequently during show tapings. Unfortunately for the collectors owning them, "the years have not been kind" producing some disappointing appraisals. Taking rarity into consideration makes sense, too. For example, a number one Ponytail Barbie from 1959 is going to be more valuable than a Bubble Cut (referring to the hairstyle) doll from the mid-60s, even though they have the same face mold. Most older dolls were bought with playful children in mind. This means they were usually either loved to death or restyled with writing implements and scissors. As family heirlooms, these dolls can hold cherished memories for original owners and their descendants. As collectibles, they don't retain much value unless they survived their early lives relatively unscathed or at least in a repairable state. There are no rules written in stone, but more than likely if antique dolls are cared for properly, an owner will see a collection retain, if not appreciate, in value over time although the doll market has remained steady to soft over the past few years. Certain Madame Alexander dolls, for instance, can be quite valuable. Since newly manufactured collectible dolls sit on shelves or in curio cabinets and are produced in mass quantities, they just don't seem to appreciate in value quickly, if at all. Even some Madame Alexander dolls have gone down in value over the years. Collectible Barbies are now a long shot too. Knowing which of these newer dolls will skyrocket in price is virtually impossible these days.